It's easy to see from the moment that you land at Spectra Bingo that it is just another Dragonfish networked brand. 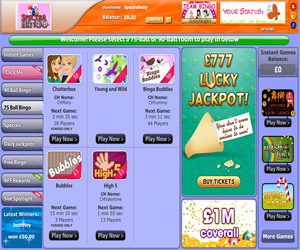 The home page design really leaves a lot to be desired and looks very plain in comparison with the hundreds of other online bingo brands available on the Internet today! All of the animated graphics on the landing page are quite annoying and we're sure could soon give you a headache. The home page makes mention of free movie tickets and free gift cards but despite our best efforts, details of these promotions could not be found which doesn't really help the poor first impression this brand already offers. Having said all of that, it is a Dragonfish networked site so we know that when we step through the virtual doors of Spectra Bingo we will find the same gaming experience as at all of the other brands using the 888/Globalcom bingo software. It takes just a few minutes to register with the site and then you are ready to play, even if you haven't made a deposit. The site offers free games to all players, depositing or not, in one of the no cost rooms from 7am until 7pm daily. The room is called Free Bingo All, the games are 90 ball and run every eight minutes with £1 jackpots. 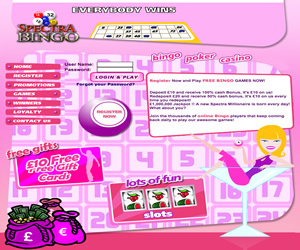 You will find three versions of the online bingo game available when you play at Spectra Bingo; 75 ball pattern, 75 ball multi-line and 90 ball bingo. In addition to this there are a whole plethora of instant win games available. Spectra Bingo do not have any exclusive promotions to offer their players but do offer the same popular deals like Team Bingo and deposit bonuses on all transactions. You will find a selection of pre-buy guaranteed jackpots at this site and it is also home to the £1 million coverall games several times a week. Having said that, the jackpot offerings from this brand aren't nearly as impressive as those available at standalone brands using this software. In summary, Spectra Bingo is a site that will appeal to the player who likes the 888/Globalcom gaming experience but offers nothing new or exciting to the discerning player. 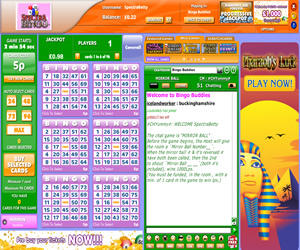 Spectra Bingo offers three variants of the bingo game at their site. Most games are either 75 ball pattern or 90 ball bingo but there are rooms that offer 75 ball five-line games too. You will find a selection of instant win games like slots, scratchcards and table games available, some of which can be played in the same room as your bingo. Wagering requirements at Spectra Bingo are 4x the amount of deposit and bonus but you can withdraw prior to meeting these requirements. However, should you not have met the wagering then your bonus money in your account at the time of withdrawal will be lost. Before you can withdraw you must have deposited at least £30 into your account.